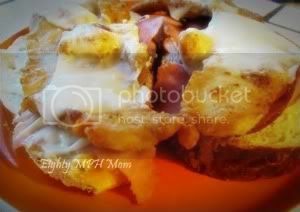 I posted these recipes on Eighty MPH Mom a couple of weeks ago, but they are just so good, I wanted to make sure everyone here had a chance to see them too – enjoy! My husband, daughter and I went to a crab feed put on by his department a couple of weeks ago. They actually had too much crab (if you can believe that), so lucky us – we got to bring home a huge aluminum pan full of dungeoness crab (the best in my opinion! )For the next couple of days, I made dishes using the crab meat, and I thought I would share them with you! Saturday night, I made these yummy Crab Rounds that my mom used to make. The Crab feed was a blast – there was a raffle, lots of wine and good people that I hadn’t seen in a long time. Did I mention wine? Oh yes, I certainly did. Ummm don’t drink and post on Facebook…the two don’t mix! Enjoy! *I was not compensated in any way for this post. This is my own personal recipe. 3 Responses to "Cheesy Crab Rounds"
These look SO good, I wish I could get hubby to eat seafood… I would make these ALL the time. Oh wow, this looks soooo good. Drool! These sound delicious! I love crab meat!